Above, the top view of an unwrapped SN20A. Above, the bottom view of an unwrapped SN20A. There is very little surface area to the power FETs, so their capacity to safely dissipate heat is diminished. Note that the large filter capacitors (~160µF) across the battery terminals are surface mount components which limits their ability to dissipate heat, and therefore contributes to higher operating temperature for a given ESR / ripple current combination. 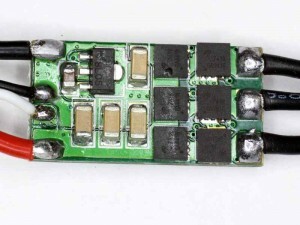 This ESC had AON7418 FETs (Vgs max 20V), some earlier production are reported to use AON7520 which have Vgs max of 12V, inadequate for 4S operation. 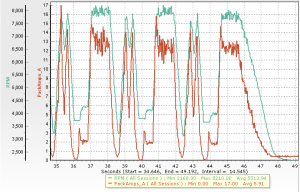 This might explain why problems have been reported so frequently on 4S. 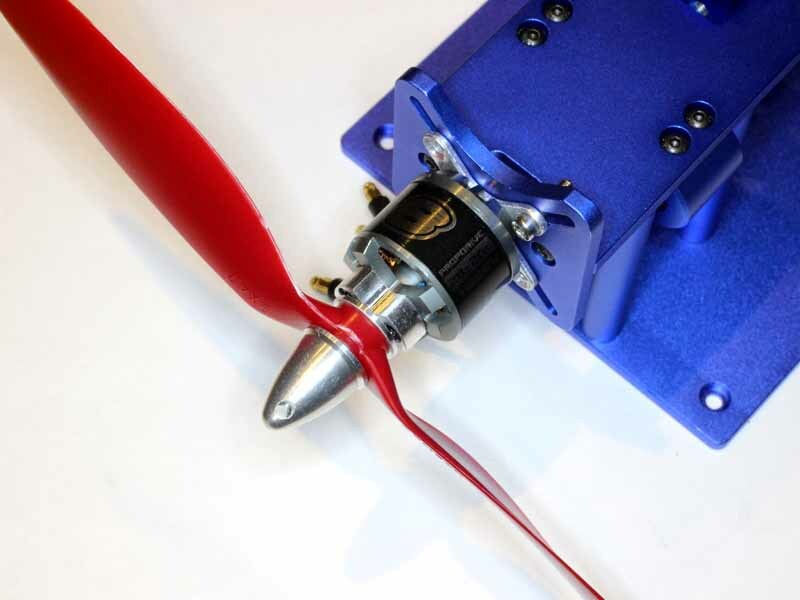 The test was conducted with a NTM Prop Drive Series 2826 1000kv motor (above) with 9×47 SF propeller in a thrust measurement jig and a 12V regulated current limited power supply. The unwrapped ESC was in the prop stream, so a fairly extreme case of forced air cooling. It was done given reports of overheating, but it is not representative of practical implementations, especially where a wrapped ESC is stuffed inside a narrow frame tube. 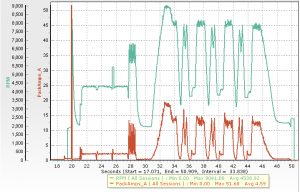 Under a steady 12A WOT run for 1 minute, the FETs increased from 20° to 25°, not much at all… but they were in a high speed draft. Note that heating of the FETS may nearly triple at the rated current of 20A. At 12V, the drive developed 8.1N (830g) thrust and drew 12.1A. A comparative test was performed with an F-20A on recent SimonK firmware, and the thrust and current were not significantly different. There have been reports that thrust is 10% or more down with SN20A, but that was not apparent in this single comparison with a popular basic 20A ESC. The SimonK repo was pulled (02bd8e4ca36a06722efe51bc7cd5130d72a184b8) and a dys_nfet module built with defaults and installed on the ESC with a Turnigy USB Linker without any hitches. Note that I do not use any front ends for this process, just traditional Makefile and AVRDUDE from bat files. 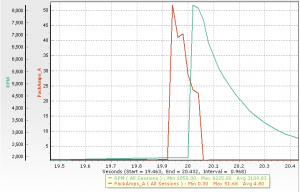 I do note that there is a lot of urging by forum experts to use aggressive advance to circumvent sync loss problems. That comes at the cost of increased dissipation in motor and ESC, and for an ESC with marginal cooling, there may be some cases where that is fatal. The module was tested with low current limit and was faultless, so was then tested at full load in the thrust bench. Results were not significantly different to those out of the box. This test used Arduino RC servo ramp generator to run a test script whilst recording the drive current and RPM using eLogger. 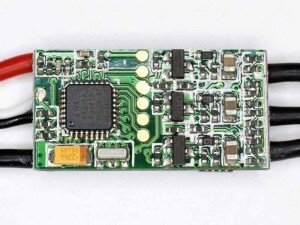 A fully charge 4S LiPo was used for the test, and the updated ESC was used. Above is the complete test. Above zooms on the jump test, a full throttle burst of short duration. The motor rapidly accelerates to full WOT RPM in a very short time, albeit requiring a surge of just over 50A (about 400% of steady WOT current). Above zooms in on another phase of the test, nice rapid but smooth acceleration with no glitching of current. 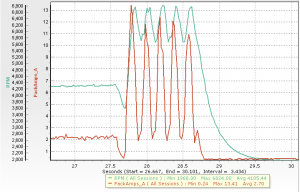 Again, rapid acceleration when ordered with no current glitches, reliable consistent behaviour. The drive performed well, no evidence by ear or from the current plot of any sync issues. 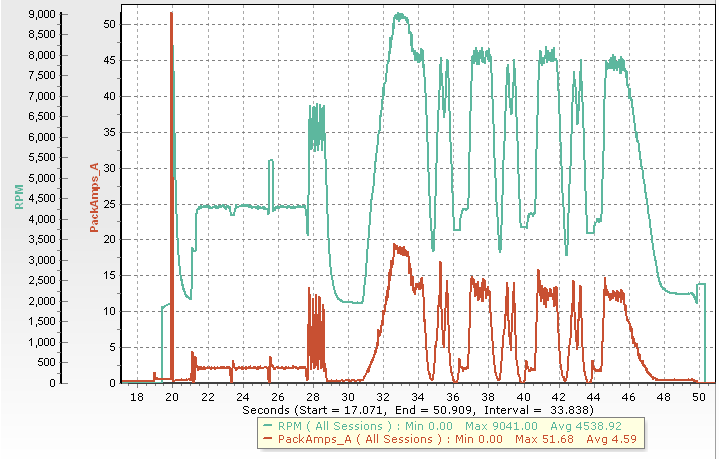 Some observers note that ESC heating seems much more severe with COMP_PWM enabled, which suggests the configured dead time is insufficient. 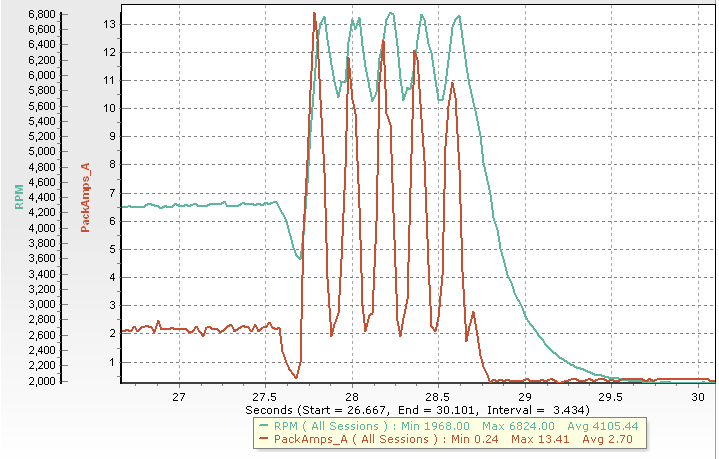 The current for min throttle was measured on 16V with and without COMP_PWM. 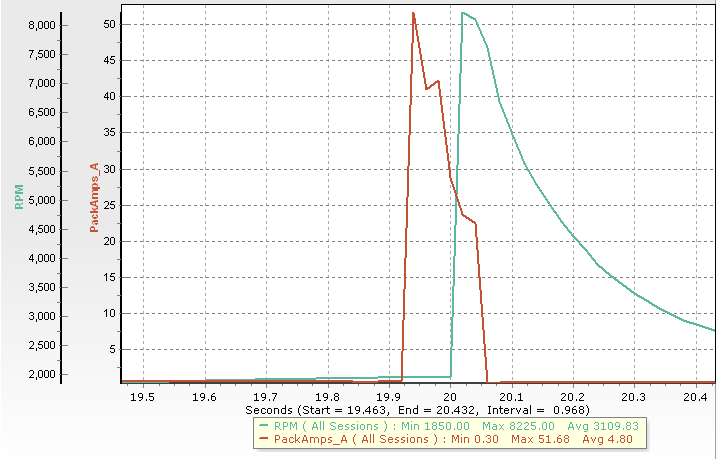 The results were 0.19 and 0.22A, lower with COMP_PWM which is a good outcome but importantly, it suggests that the configured dead times (300/300ns) is sufficient and does not confirm the reported observation of some users. This was a test of sample size one, and meaningful conclusions cannot be drawn about product quality. There are reports of high failure rates, inconsistent product delivered (wrong firmware, wrong bootloader unknown version etc). For that reason alone, buying these is a risk. Out of the box, the installed SimonK firmware worked just fine on a motor that has figured in reports of sync problems with Afro30 ESCs. 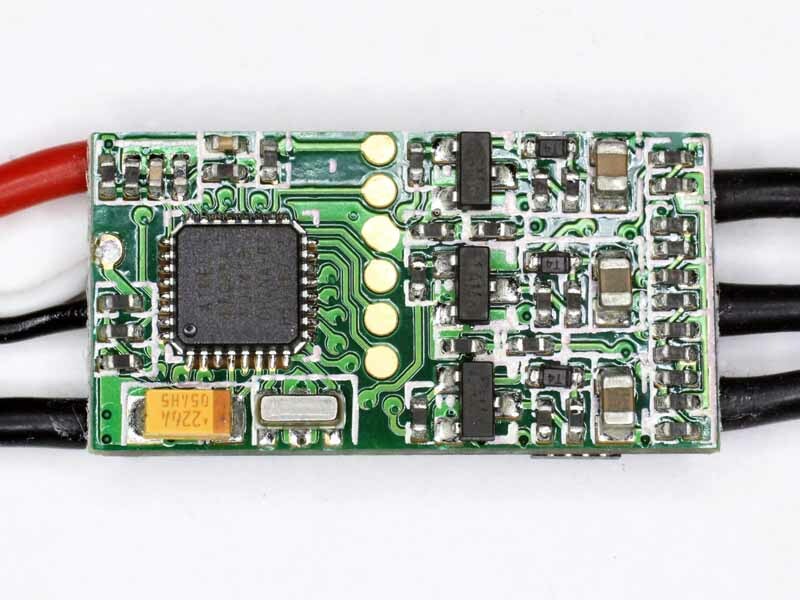 No problems were encountered building or installing the SimonK dys_nfet.hex module. The drive showed no tendency for sync loss. Many reports of problems setting fire to ESCs and/or motors seem to be from people using front ends, and one wonders if there are flaws in some of them that result in incorrect builds that are subsequently tested direct on a LiPo battery and damaging currents flow. This is not an ESC that I would favor, it has limited capacity to dissipate heat, limited capacity to absorb heat due to transient loads… basically it lacks the features that make a robust ESC, but makes a substantial saving in mass, weighing in at about 2/3 the mass of the F-20A that I also tested. Essentially, it probably comes down to the individual choice of performance vs reliability. Update 19/07/2015:After an extraordinary number for reports of crashes, ESC fires, damaged motors etc, DYS have announced online the availability of a revised version to address some of the reliability issues reported by users. 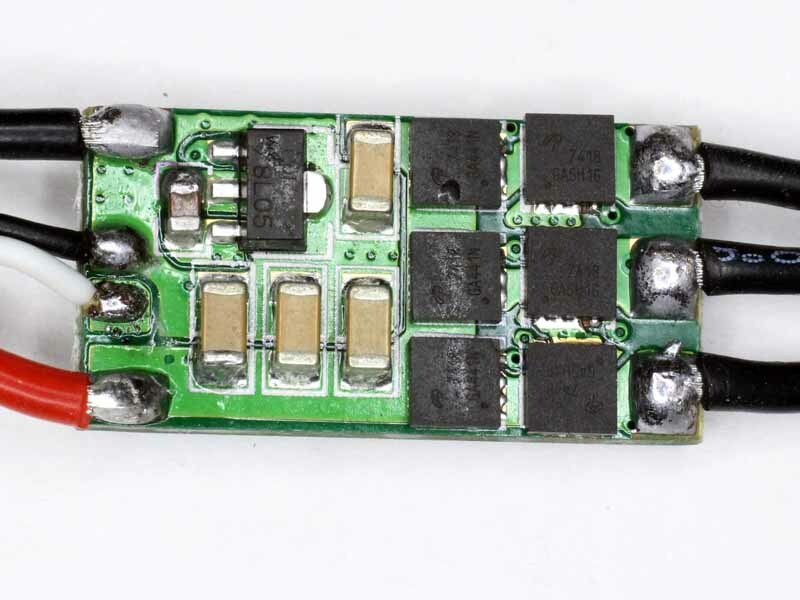 Online discussion has included pics of some kind of adhesive to fix the end FETs in place, so allowing the solder to melt without the FETs sliding off. There is a fundamental problem if the FET solder melts in service (as reported by some users), and gluing the FETs down is not a fix for the underlying problem, but questions the whole quality issue and this action convinces me to not further consider DYS ESCs (whatever their final branding). Regarding the DYS mini esc issue, before some customer reflected the mini esc will be burnt easily and it cannot work with the motor properly, until now for some study and testing, we find the solution. All the mini escs no need to send back to the dealer now. It just need to upgrade to BLheli 14.0 version to avoid these issue now. Please take a little time to upgrade the version to save more time for your flight. That seems to suggest that the problems were entirely or mostly due to BLHeli, and perhaps why my tests with SimonK did not exhibit problems. I ceased using BLHeli some time ago… which meant discarding some expensive SiLabs based ESCs. My recollection was that some pre-release versions of BLHeli 14.0 had serious problems (motor reversal destroying ESC and motor?). There have been so many reports of problems with these ESCs, and mostly with BHHeli 14.0 beta and production versions that I have been reluctant to commit my single test ESC to the likely destruction. It installed under the SimonK bootloader without fuss and was tested on the ESC which is now encapsulated in clear heatshrink, all previous tests were naked to maximise cooling of an ESC that has reported overheating problems. although encapsulated, the ESC hung in the propeller air stream and was probably cooled more than it would be tied to an airframe, much less enclosed in frame tubes as is often done. 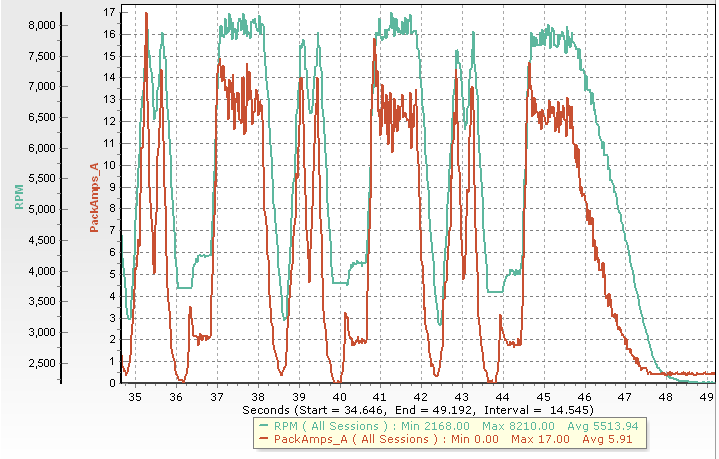 Tested on a motor at 5A on 3S, temperature rose within a minute by more than 45° and was still rising quickly. This is dramatically different to the earlier naked test and is a little alarming as the temperature rise at idle was negligible, and that suggests that the temperature rise is due to I^2R and that the ESC is unlikely to safely handle even 10A continuous (probably four times the heat dissipated, and a temperature rise of 180° or more will be damaging). The latest SimonK (103edb5a08571cd4b7ccf0be5427eb3065666533) was built and installed and the same test conducted. Though temperature rise measured was a little less, it was not a significant outcome. The tests raise real concern over temperature rise with both types of firmware.